You’re sitting at home stroking your cat’s fur after a long day when you feel it: raised bumps on the surface of his skin. It’s easy to jump to conclusions and believe these bumps, or lumps, signify a tumor. But don’t fret; bumps on your cat’s skin do not always spell feline cancer. There are several causes and several options for treatment behind these bumps. So what is a pet owner to do with this discovery? Read on for the proper next steps on what to do if your cat has bumps on his skin. It is not uncommon for cats to develop bumps on the surface of their skin. These bumps, when solid in appearance and without liquid or pus inside, are medically referred to as papulonodular dermatoses. Smaller bumps are called papules, while larger ones are referred to as nodules. Papules are produced when inflammatory cells infiltrate tissue, while nodules occur with a massive infiltration of inflammatory cells into the skin’s layers. There are many possible causes behind the bumps on a cat’s skin. Determining what caused your cat’s bumps is key to knowing how to treat them. Of course, the underlying cause is not for you to figure out, yourself. Through laboratory tests or from your first visit alone, your veterinarian will be able to diagnose these bumps. Your veterinarian will discuss the next step in the process with you, which may include a physical exam. Standard tests include a complete blood profile, a chemical blood profile, a complete blood count (CBC), and urinalysis. During this step, the vet will use a scalpel to gently scrape your cat’s skin and produce hair and skin samples for testing. These samples will be sent to a laboratory to check for parasites, bacteria, and possible yeast infections. In some cases, a vet will be able to diagnose the bumps from this first exam. During this time, it may help to be armed with questions that can open the conversation to understand your next steps. What kinds of bumps are common in cats of this age or breed? What kinds of masses are common in this area on a cat? Would you recommend further testing? Is my pet experiencing pain? Do you think the organs, bones, or tissue could be involved? What are the worst and best case scenarios? Do you recommend performing a biopsy? If so, which kind? How accurate is the procedure you’re recommending? Could the treatment plan change with a clear diagnosis? Once the diagnosis is made clear, your veterinarian may prescribe oral or topical antibiotics if bacteria are involved. If your cat has parasites, he will need to bathe in a parasitical dip. If the bumps are a result of too much sunlight, you will need to limit his exposure to the sun, or apply sunblock safe for felines. If your cat likes to sunbathe next to a window in your house, light filtering shades will help block the UV rays. In more serious cases, a cancerous lump may call for a mix of surgery and therapy. This route can be quite costly and invasive, so understanding the prognosis with and without this treatment is essential. Ask your veterinarian for your options, and the best- and worst-case scenarios with each. In other cases, your vet may require return visits for regular testing, should your cat’s condition call for it. In the end, know you are not alone; bumps on a cat’s skin can and have been treated very successfully in the past. Knowing the underlying cause, getting the right diagnosis and treatment, and showering your cat with regular TLC are just what he needs to thrive. “Cat Skin-Problem Pictures: Lice, Fleas, Ringworms, Ear Mites, and More.” WebMD, Accessed 25 May 2017. www.pets.webmd.com/cats/ss/slideshow-skin-problems-in-cats. “Skin Lumps and Bumps in Cats.” WebMD, Accessed 25 May 2017. www.pets.webmd.com/cats/cats-lumps-bumps-skin#1. 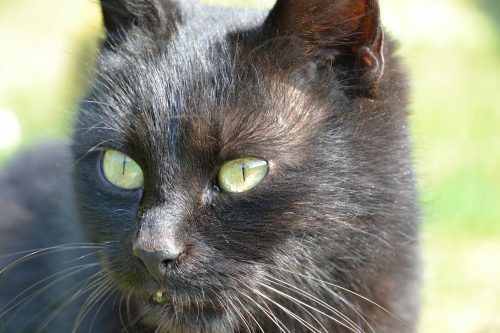 “10 Cat Skin Problems and How to Handle Them.” Catster, 11 Oct. 2018, Accessed 25 May 2017. www.catster.com/cat-health-care/cat-skin-problems. “Skin Bumps (Papulonodular Dermatoses) Cats.” PetMD, Accessed 25 May 2017. www.petmd.com/cat/conditions/skin/c_ct_skin_bumps_masses. “Lumps, Bumps, Cysts, and Growths on Cats.” PetMD, Accessed 25 May 2017. www.petmd.com/cat/general-health/lumps-bumps-cysts-and-growths-cats.